Now that the summer is ending I feel that I have tried enough face primers to truly review them. Sometimes I think I like a product the first time I use it and then realize after a few tries that it is not working with my skin at all! Just so you know I have the most sensitive and oiliest skin possible and if I didn’t wear a primer foundation would literally slide off my face. 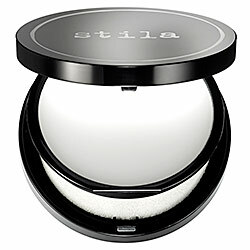 I went to Sephora on a hunt to ask for samples and I was given the new Stila Stay All Day Prime & Anti-Shine Balm ($39 CAD) to try. This primer is basically a solid that you rub your finger into or use the sponge that is provided and pat it on your face prior to foundation application. This is the strangest primer I have ever used but you get used to it, although it does feel a bit unsanitary (only use clean fingers!). It is not recommended to pat over top of makeup if you get shiny throughout the day if that is what you’re looking for I would recommend the Porefessional by Benefit. This primer glides very easily onto the skin and I did not experience pilling with it like I have with other brands. A little goes a long way so I think it will last me quite a while which is a benefit – I do find that with liquid primers I tend to squeeze out too much and waste product. I tested this out for 2 weeks straight so that I could get enough of an idea how I like it with different products. I have used it under my Mac Studio Fix Fluid as well as under my Estee Lauder Day wear BB Cream and I found that it worked amazing with both. I did powder my face after applying foundation because I do have such oily skin that no primer can completely prevent all the shine I tend to get. After a few hours I am noticeably less shiny than with other primers I have tried , although if it has been a busy day in the heat I do have to blot mid-day. If you are someone with extremely oily skin like mine I would suggest setting your foundation and maybe expect to blot once or twice by the evening. By the end of the day my foundation has stayed on without moving around or getting patchy and if I plan on going out at night without changing my makeup I will blot again and maybe spray some Mac Fix +. Overall, I found that it really helped my skin stay more matte and I only dealt with a bit of shine in my chin and forehead which are my extremely oily areas of my face. This has been the best primer for anti-shine that I have tried so far. I think combination to oily skin types will love this primer because of its anti-shine properties and its silky texture on the face. Girls with dry skin beware that this is a product to combat shine and not hydrate so I would definitely not recommend this for you. If you have dry skin I would definitely not suggest this because it is meant to combat oil and not hydrate. I am definitely going to be purchasing the full size next time I am at Sephora. If you know of any cheaper primer alternatives that are good for extremely oily skin let me know in the comments! I always love trying out new products.